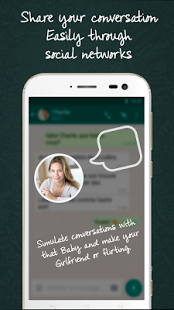 – You can create chats with any person you want. – You can create screenshots identical to the chat app and your friends might not tell the difference. – You can control the two sides of the chat. – Besides, you can send pictures and audio. – You can change status as “last seen”, “online” and “writing”. 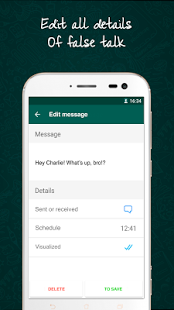 – You can change messages’ status as “seen”, “received” and “sent”. New version 2.0 completely reformulated! 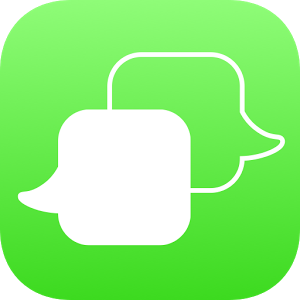 Greater fidelity to messaging applications. Uploading images. Possibility to use the application for up to 5 times without advertisement for free. Greater stability. Much more real, easy and incredible to use! 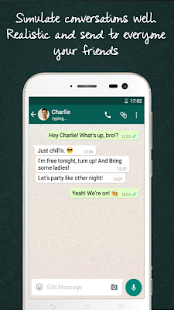 0 Response to "WhatsFake Pretend Fake Chats v2.5.14 [Pro] Apk [Latest]"